Compressed air piping systems, used in a variety of industrial applications, are ideal for meeting specific energy requirements and delivering uncontaminated compressed air functionally and aesthetically. Once compressed air has been filtered to remove contaminants and dried to reduce the presence of and damaging effects of moisture, it is conveyed through a compressed air pipe system to serve its unique purpose as an energy provider for industrial processes. Source your maXair compressed air pipes from the professionals at Air Energy. These PE100 compressed air lines offer superior performance with their levels of pressure and flow, corrosion resistance, compatibility with various compressor oils, and the ease in which they can be installed and modified. Compressed air is one of the most expensive utilities in many businesses. There’s an assumption that the majority of the cost of compressed air is in the initial purchase of the machine. In reality, the equipment itself accounts for only 21% of the cost of generating compressed air, while service and maintenance take up 7%. 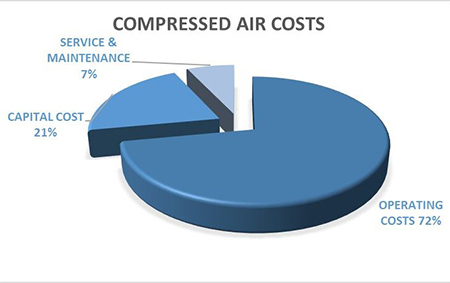 The bulk of the compressor’s lifetime cost goes to operation, which makes up 72% of the overall cost. With a range of diameters available, ranging from Ø20 to Ø158, and a choice of straight 3 or 6 metre, S bend or U bend pipes, you’ll be able to create a fast, easy and reliable compressed air pipe system with Atlas Copco Airnet. Contact us today by calling (03) 9765 5600 to discover how we can help you. Manufacturers of industrial tools and equipment since 1873, Belgian company Atlas Copco is widely regarded as the world’s leading producer of compressors air pipes and associated equipment. We supply three of the brand’s major product lines: the air compressor, Air Net compressed air pipe, and air tools. Founded in 1965, Sullair produced its very first portable air compressor soon afterwards, with their first stationary rotary screw compressor following in 1968. As a brand, Sullair continues to innovate and develop a comprehensive product range that meets the compressed air needs of industrial and commercial clients alike. For over 30 years, Australian company Glenco Air & Power has delivered superior quality air compression solutions at competitive prices. 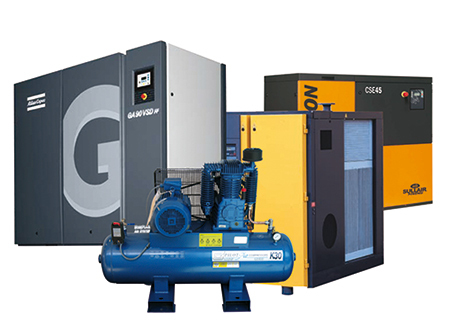 Founded in 1984, Glenco has launched their own line of premium industrial compressors with brands such as Airmac and Senator. They continue to go from strength to strength, providing world class products and services with a distinctly Australian heritage that complement our range of compressed air pipe. This German company has been producing quality industrial machinery since 1907. They manufacture a range of air compression products, specifically piston and screw compressors, with both oil-lubricated and oil-free variants available. BOGE epitomises technical excellence and design innovation, two characteristics that are evident in every piece of machinery they produce. Founded in Germany in 1919, Kaeser specialises in the design and manufacture of air compressors and vacuum products. They supply a versatile product range, from portable and rotary screw compressors to reciprocating and dental compressors and more. They’re committed to delivering exemplary after sales service, ensuring any breakdown and essential spare parts are despatched within 48 hours. We recommend Installation as part of a quality package with Air Energy compressed air pipe. Select the right pipe size – Take the factors of required flow, distance and future expansion into account when choosing the best size (between 20 and 160mm). Other than these factors, knowing the minimum operating pressure of your equipment is critical to choosing the right pipe size. This should be based on the manufacturer’s minimum requirements, not what you have been previously operating at. Don’t Choose an Undersized Pipe – Using an undersized pipe restricts air flow and some operators effort to solve that is to increase the air pressure. If you need to operate your system at 125 PSI to get to point-of-use 100 PSI, this produces 25 PSI of overpressurisation – resulting in 12.5 per cent of wasted energy. Select fittings – there are different fittings available that best suit specific requirements. We stock Socket Fusion Weld fittings, Compression O Ring fittings and Electro Fusion Weld fittings. Select outlet requirements – choose outlet filtration, regulation and lubrication requirements, as well as quick couplings, hoses and other essential pieces that best serve your requirements. If you need assistance in choosing the right fittings and outlet requirements, give us a call. Our air pipe specialists are knowledgeable on what types of outlet requirements and fittings complement our range of compressed air piping systems. If you need to install new compressed air piping systems on your industrial worksite, or would simply like an audit on an existing compressed air pipe system, get in touch with the experienced professionals at Air Energy today. Call (03) 9765 5600 to see how we can help you.